Of all the natural earth elements, fire is perhaps the hardest to control and the most thoroughly destructive. Gabriel Merrick has been able to transform this incredibly powerful element all his life–but problem is, right now he’s having trouble controlling it. And in his desire to prove himself, he takes on dangerous risks that alienate those he cares about the most. The author’s descriptions of the magic harnessed and the gorgeous yet frightening sight of fire flaring out of control are incredibly evocative, and will likely satisfy those who felt let down by a similarly themed but disappointing Struck. Given how convincingly the fire element is described in this book, it’s entirely possible that the author’s deadly accuracy comes from personal experience with playing with this fascinating and unknowable force. Theory #2: Brigid Kemmerer is surrounded by gorgeous, playful men who know how to kiss a girl senseless. It’s hard to write a male who is cocky, sarcastic, and a nice guy underneath it all, but Gabriel is a completely believable teenage guy who mouths off without thinking, but who is also capable of decency and tenderness. Both he and Layne, the troubled girl who tutors him, are layered, interesting characters whose relationship develops naturally. All the hot and heavy makeout scenes and underlying emotional growth in this book are likely the result of months and months of hedonistic indulgence as the author “researched” her book. Theory #3: Brigid Kemmerer stole the prized guidebook on How to Write a Fun Paranormal Romance. This highly coveted manual outlines how to introduce fascinating powers, nuanced characters, snappy, amusing dialogue, and highly entertaining plots. What’s especially interesting about Spark is that Kemmerer mixes up some of the usual paranormal checkpoints so that the main character is denied his power and the romantic interest is unaware of his abilities for most of the book, so that the swoon-worthy romance and the brotherly relationships are what really carry this story through. The fact that the subject was able to write a fun and fluffy book that isn’t shallow provides nearly irrevocable proof that the author has confiscated the very few copies of the guidebook that exist. CONCLUSION: Subject must be captured at all costs and detained until the remaining Elemental books are finished, so test readers may go through the series quickly as quickly as possible. It is absolutely vital that their exposure is limited to a short period of time. Failure to contain Kemmerer’s growing popularity will result in untold damage to readers’ health, work habits, and relationships as their rampant enthusiasm for her books will continue to override all common sense. If you’re interested in volunteering despite all of our attempts to convince you how much reading these books will affect your well-being, all you have to do is fill out the Rafflecopter form with contact details along with a comment below. I’m excited to read these books mostly because of the covers. They have so much color! And they sound good, too! I read this series over summer vacation and very much enjoyed it. There is something about the mythology behind the book that I really love. I’m very excited about the next book in the series and would love a chance to read it! Well this was original and fun! How did I missed it? Hehee! Ha! I absolutely love the format of your review, Wendy! I think I am safe from the threat as I liked but didn’t love Storm, but I am keen to read Spark! I haven’t read any books in this series yet, but they are definitely on my TBR list! They sound so different from everything else out there – boys who can manipulate the elements?! Awesome! Thanks for the great giveaway! I just recently heard about this book/series and read so many great reviews that I can hardly wait to read it. It’s on my to read list now. Oh my God! Everything you said. Everything you said! It’s all true. Haha! This review is amazing. Oh, my God. Everything you said. Everything you said! It’s all true. Haha! This review is amazing. I’be only read elemental, and have started storm and already I can tell I am going to fall in LOVE with this series! It has everything I like; action, romance, comedy. How could you pass this up?! This is amazing! Storm was so much fun to read. I quite liked Storm but not to the point that I’d gush about it like I usually do with my favorites. I saw the potential the series held though, and so was quite put off that there’d be no more Chris and Becca as the central point of the next book since they’d just ended with such a happy note. That being that, I kept delaying picking up Spark, because I was unsure how it’d turn out.. I totally loved this review! I’ve been hesitant in picking this up for some time now- because I when I read Storm, I rated it to be mediocre but couldn’t fail to see the potential it displayed. I’d hoped to get into the series, but since each book was to be a different story, I felt skittish regarding how they might turn out and just couldn’t face the fact that there’d be no more of Becca And Chris. Your review has me feeling mad to get my hands on this book now, though! To be completely honest… having seen these books around I haven’t been particularly interested in reading them, but this review has DEFINITELY changed my mind. I’m about to buy Storm from the Kindle store because I saw this review on Goodreads and just couldn’t believe all these things are possible BUT I trust you as a reviewer. It’s been a long time since I read a paranormal romance that didn’t feel like a rewrite of Twilight. Okay, well, I didn’t quite mean to stay up until 3 last night finishing Storm, but hey, plans change. I felt like a teenager again… it was the strangest thing. Thanks for reviewing them! I haven’t read the 1st book as of yet but so many of my friends have read it and raved about it that I simply must get my hands on it. Have Storm on hand now and can’t wait to dig in. Thoughtful and substantive reviews aside (though greatly appreciated) …. this series has *4* hot brothers *and* they can control the weather?? … really?! And plot plus great writing?? This is likely not coherent, let alone intelligent, but… yeah…I’m excited. I can’t wait to read Spark. I couldn’t put Storm down – I stayed up half the night to finish it. I haven’t even read book one yet, but I don’t need an excuse to go out and get it ;) It looks SO good! Great giveway! I haven’t read this series yet. But I have the first book and I’m waiting to read it asap! Your review was so much fun! I haven’t read the series yet, but I keep seeing these books everywhere. Here’s hoping for a win this time! If you enjoyed it that much, then I DEFINITELY want to read it. Here’s hoping! Also, this review is hysterical, as I’m sure you’ve been told roughly eight million times at this point. :) Some of my favorite reads are the 4 stars. They may not have the literary merit of 5 stars, but DAMN are they fun. In order to help rapidly spread the contagious force of the Elementals I gladly offer my self as Test subject! Please consider me as I have many regular readers I must ‘protect’. One has already succumbed to Merrick disease and must now get regular doses to maintain happiness! HAHAHAHA! O…M…G!!! This is the most Merricklicious Elemental review EVER!!! Wendy, you seriously ROCK! A HUGE shout out from Merrickland!!!!! HAHAHAHAHA! This is the most Merricklicious review we have ever seen! Wendy, you ROCK!!! A huge shout out from Merrickland!!!!! Such a funny review! It really made me want to read this series! According to your hypothesis, this book is highly addictive. And other than that, I’m a series kinda girl! I’ll always be pleased to add a new, great book to my reading collection! Wow, I love the unique way this review has been written. 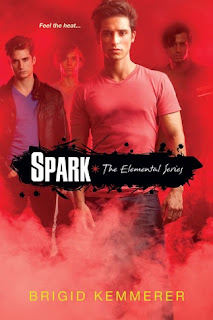 I am dying to read the Elemental series! Also, your conclusions has definitely made me restless here. P.S. Not sure where you got the inspiration for your review format here, but I love it! The Merrick brothers are so freaking awesome! They’re all so deep and amazing and hot haha. I liked Gabriel’s story the most because he evolved so much. His character in Storm hints at nothing that is going on underneath that we see in Spark. It’s amazing! I’m a bit wary of starting this series because it’s so hyped but if you’re love it too, Wendy, I may have to give this series a try. I love the way you’ve written this review. It’s so fun and creative! I’ve heard so much about the first book, and every time I hear more, another piece of me dies from impatience. I’ve GOT to find a copy! I’ve read so little of YA Paranorm that it’d be nice to start a new great series. From your review this book seems so wild. Would be interested in reading myself. Oh.my. I’m swooning already, & I’ve only read your review!!! I MUST get my hands on this series!!!! Thank you for the opportunity to possibly win a copy!! Can’t wait!!! I love reading how they try to adapt with their element through their everyday life. I haven’t read this series yet but would like to! I’ve heard a lot of great things about it! Extremely dangerous indeed! I love this post, Wendy. ;) These particular symptoms I get just thinking about the Elemental books -> irregular breathing, flushed cheeks, and most alarmingly, a tendency to dissolve into incoherent giggles while reading the novels. I just laughed so hard I think birds in the surrounding trees took flight in fright and alarm. THIS. I can just imagine the look on Brigid’s face when she read this! So many people have said amazing things about it, and this review makes me want to start reading this series even more! Your review is to awesome!!! I want to red this NOW!!! I’ve shared and pinned and tweeted! I really REALLY want this book!!!! All of those symptoms are totally accurate! I got all kinds of strange looks while giggling over my nook. I have to say, I’ve read both Storm and Spark (as well as the little short stories Elemental and Fearless), and I really believe that Spark is my favorite, at least so far. I just love Gabriel’s character, I think it’s the bad-boy with a core of gooey sweetness that’s to blame. I am officially a fangirl! SOLD!!! I wanna, wanna, wanna, wanna, wanna read this!!! I’d have to say that I not only love the series because of the elemental powers that each brother has but also because of their brotherly-dynamic. They are in no way the ideal perfect family, but they are as perfect in their own way. They lost their parents and Michael becomes pseudo-mom/dad to the boys, which is sad but so admirable and sweet. Although I’m pretty sure Michael wouldn’t like it if you called him sweet to his face. haha. after that review how could I NOT want to read this book. WOW. Good luck to everyone who entered the giveaway! Decided to give up my chance since I’ve already read this book like the day it got released. Brigid Kemmerer has created a really fun paranormal series with Elementals and I simply CANNOT wait for the third book. I love this review, such an interesting and different way to write a book review! Also, good luck to everyone who entered the contest! I shall give up my chance for this considering I’ve already read the book. Simply can’t wait for the third to come out. I need my HUNTER. Hot guys don’t really attract me to a book, but pyromania, now that’s a draw. I absolutely love the series! I read the first book already and it was amazing! And all Merrick boys are incredibly hot! I was so excited to read this book and it didn’t disappoint! I also enjoyed the review format, but that thing that resonated most to me is that I think that I tend to dislike most cocky-guy characters, but Gabriel is definitely the exception… I just know that he’s a nice guy and that’s what makes him so awesome! I really enjoy this series. Even though sometimes I get tired of all that teen angst, I understand that’s it realistic behavior, and the writing itself truly makes you want to read more. Her books are very hard to put down. Your review is awesome, Wendy! I was already going to start this series because of the premise and the promise of so many uberhot guys but your review has sealed the deal. This review had me laughing so much! I loved Storm and can’t wait to read Spark- reading your thoughts on it have just made me want to read it even more. I’ve heard so many great things about this book! I love any books w/ families and siblings, plus the paranormal element just makes it so awesome. I also got Storm but have yet to read it. What a cute and cleverly written review! It makes me even more excited for Spark! This is such a cute and cleverly written review! It makes me more excited to read Spark! First of all, thank you for the wonderful review! :) The subheadings really are a nice touch to the review. So…why I want to read Spark. Actually, I’m just about to read the first book. I love books themed with elements. And when I found out that my closest blogging friends are going gaga over this? And that we have the same book tastes? I went a little crazy. I have to admit that their enthusiasm, along with your review, finally made me decide that I want this and I need this series in my life! I love the way you’ve structured this review, Wendy — and it certainly “sparked” my interest! I’ll have to add these to my (growing) TBR list — somewhere near the top. What a clever review! I’m blown away by your creativity, Wendy. I’ve heard such great things about the Elemental series. I can’t wait to read it. OMG what an excellent review Wendy, lol its superrrrrr amazing. I cant wait to read this book now as in superrr badly need it now. I have heard SO many amazing things about this series… but my library has yet to purchase any copies! I’m seriously going out of my mind trying to get my hands on a copy of this book. So glad you liked it too, Wendy! I have heard SO many amazing things for this… yet my library has yet to purchase any copies! I’m seriously going out of my mind trying to get my hands on a copy. So glad you liked it too, Wendy! I love this series! Can’t wait to get hold of Spark! So glad you loved it. I’ve been stalking The Elementalists facebook page for awhile….they reshare a lot of my stuff, and that got me interested in the books….and then I started hearing about the books. NOW I MUST READ THEM. I WILL VOLUNTEER AS A TEST SUBJECT. I know this book sounds extremly dangerours, but I’m willing to take a risk. These symptoms are just what I’m looking for! Awesome review, it is hilarious! You just made the series even more interesting to me! Well, sometimes you have to brave the danger to get to the treasure. ;) Thanks Anatea! I just bought the first book in the series on Amazon. Looking forward to reading it! Awesome review! I love it!! Love, love, love the review. Well done, Wendy! Hee. Thank you, thank you, thank you! Clever clever review! I don’t think love can be defined, it is different for each person. Oops, sorry about that–I think the question from the last giveaway was still up there! But no worries at all, you’re entered for the giveaway. :) Love plays a role in this book, too. Quite an entertaining review Wendy! Looking forward to reading this next installment. Thank you! I hope you enjoy this one just as much as the first one. Well i didn’t even new about the existence of this book before i read this awesome review. here i am hoping that the book is as awesomely well written as this review. I really want to read it now! Well your review was awesomely compelling. I had no idea this book even existed, but after reading this review there’s no way i could ignore it’s existence any longer. I feel like i’m losing something by not reading it so i will give it a try. Well, thank you! I think it’s a super fun series. I’m glad I’ve convinced you to give it a go; hope you enjoy when you get around to reading them. Ohmygod, I can’t wait to read this! I loved storm. Fantastic giveaway! Hehe, I laughed so hard during this review. I haven’t read any of these books yet, but I’ve heard tons and tons of great things about them and I’m absolutely dying to read them. They sound like exactly the kind of thing I’d love. THEN I HAVE DONE MY JOB. ;) Yay! Hurry up and read them–they’re perfect for those occasions when you want something more light-hearted. YES! Thank heaven they are out with six months (ish) in between, I think we’d have to make good on that plan to capture Brigid if it was a full year like all the other series. Yeah, I don’t really think it’s necessary to read the first one before this one. I mean, it’s better if you CAN, but there is some recap of previous events and I feel as thought this book really does stand on its own. I hope you like it as much as I do, Sarabara! *Buzz buzz buzz* That’s me, working you up into even more of a frenzy! These are totally worth owning, I need to get myself a paperback version of the first book, too. OMG love this review of this book. I was laughing at all the theories..I want the hot men too :) I haven’t experienced this series yet. You have no idea how hot these guys are, Julie. I’d heard about them before I read the books, but I’m a little skeptical about more shallow male characters and romances. I’m happy to report, however, that THESE boys are just my type of crush. ;) Hope you get a chance to read this series soon! Heh, I hope the illness sweeps over you too, Vivien! I can’t imagine it won’t.